Spaceballs stands the test of time as one of Mel Brooks best films in a lifetime of comedic genius. One of the most celebrated film franchises of all time, ‘Star Wars' is also notably one of the most lampooned. From web classics such as "Troops" ( a parody of ‘COPS' starring Storm Troopers) to the tongue-in-cheek LEGO video game versions of the films the sheer scope of the Star Wars Universe lends itself to satire. Perhaps nowhere else is the love for Star Wars and its characters, mythos, and mark left on the cinematic landscape more prevalent than in the 1987 quintessential parody ‘Spaceballs'. Presented here on Blu-ray disc in a 25th anniversary package, the Mel Brooks helmed comedic masterpiece returns us to a galaxy "very, very, very, very far away..." and still as irreverent as a quarter century ago. Co-written, directed by, and starring the aforementioned Brooks (Blazing Saddles, History Of The World Part 1) it is clear going into the film it is not to be taken seriously. This is pure satire through and through, filled with sight gags, inside jokes, brilliant 80's popular culture references, and a common theme of "breaking of the fourth wall" in cinema. Brooks has made a career out of these films and his earlier work, in which Spaceballs can be counted, is by far his best. The story loosely follows that of the Original Star Wars trilogy borrowing more from the archetypes of the characters themselves than the actual plot. Some other period science fiction films including Alien, Star Trek, and Planet Of The Apes get a ribbing too but it's Star Wars at the heart and soul of the film. ‘Princess Vespa' (Daphne Zuniga), a more aloof, haughty version of ‘Princess Leia' is set to marry a disinterested Prince Valium. Before the ceremony can commence she hightails it out of castle on planet Druidia ("funny, she doesn't look Druish") to run away from her shackled life as a princess. Her father, King Roland enlists the help of "Lonestar" (Bill Pullman) and his sidekick "Barf" (John Candy) to save his daughter for a million space bucks. Lonestar (a hybrid composite of Han Solo and Luke Skywalker) and Barf (half man / half dog "Chewy" knock off) accept the job so they can pay off their debts to ‘Pizza The Hut', a boiling grotesque blob of cheese and tomato sauce. 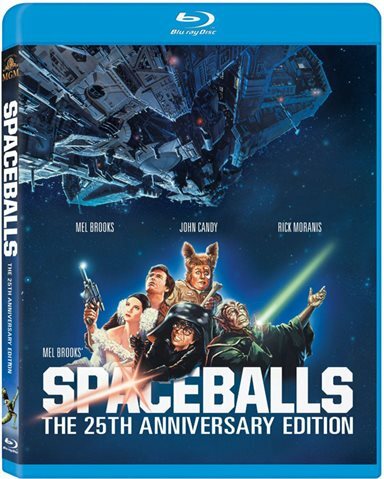 Before long the evil ‘Spaceballs' led by Dark Helmet (Rick Moranis - an incompetent, bumbling homage to Darth Vader) and President Skroob (Brooks) kidnap the princess in attempt to extort the King for ransom before sucking all of the clean air out of the planets airlock. Along the way we meet several other Star Wars influenced characters including the Yoda-esque ‘Yogurt' (also Brooks) and female version of C-3PO "Dot Matrix" (voiced by Joan Rivers). Lonestar also learns the ways of the "The Schwartz" a play, of course, on ‘The Force'. Everything about Star Wars is skewered including the over saturation of merchandising (they have for example, "Spaceballs:The Toilet Paper") to the inevitable sequels mentioned by Yogurt: "We'll all meet again in ‘Spaceballs 2: The Search For More Money'. " Either you find this type of whimsical quip funny or you don't, but if you do Spaceballs perfects it. Of course the story is ridiculous but thats not the point. The plot is simply a vehicle for driving the dialog between comedic set pieces, all of which are clever, humorously phrased, and delivered with impeccable timing. It's hard to point to a more witty film, even in Brooks' own catalog, which delivers on the same level as Spaceballs. Star Wars references aside, there are so many classic lines and moments of laugh out loud hilarity that stay fresh even 25 years later. Beyond the brilliant repartee from the characters, the sight gags and puns in Spaceballs are second to none. Star Wars fans and fans of comedies alike will enjoy this farcical romp through the Star Wars Universe. Newcomers to the film will no doubt be enthralled while those who have see it multiple times can relive the nostalgia over and over again. Spaceballs stands the test of time as one of Mel Brooks best films in a lifetime of comedic genius. Download Spaceballs (25th Anniversary Edition) from the iTunes Store in Digial HD. For more information about Spaceballs visit the FlickDirect Movie Database.